It's multiplayer bubble popper mayhem in Bubble Town! Go head-to-head with players around the globe. Bubble Town brings the best of bubble popping gaming. Make matches of three or more to clear the pieces from the board! Bubble Town adds an interesting twist by putting the focus on skillful moves rather than fast, frenetic gameplay. Bubble Town rewards bankshots and strategic gameplay over straight shots, so plan accordingly and get your A-game on! What could take bubble popper puzzles to the next level? How about competitive, worldwide multiplayer? Now we're talkin'! Bubble Town lets you pit your bubble popping prowess against other players in real time. Go head to head, participate in tournaments and hone those bubble matching skills! Bubble Town keeps track of your wins and losses, and you can rank up to higher levels within your League. Moving up gives you the opportunity to compete for better prizes and more money, so play each round as if your career depends on it! Ready to make bank with your enviable match 3 skills? Then put your money where your mouth is and play for real cash. If you win, the money is yours. Not ready to put actual cash on the line? No problem! You can play Bubble Town for free to get that essential practice. Whenever you're ready to put real cash on the line, switch over to real cash. Simple! The pieces in Bubble Town aren't the inanimate objects you're used to in bubble shooter games. These guys are alive! They are alive and have an influence on gameplay. If they start to snooze on the job, you're gonna have to wake them up! There are several unique Borbs in the game, each with their own unique character. If you find these adorable Borbs too distracting during gameplay, you have the option to turn their faces off, turning them into multicolored marbles for distraction-free play. 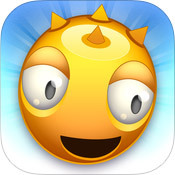 Bubble Town is snappy and responsive for fast, accurate aiming and firing of pieces. Just place your finger on the screen, drag the cannon to aim and then lift your finger to fire. Easy and effective! Need to cancel your move? Drag your fingertip down to the base of the cannon and release. Now your shot is canceled. These responsive, intuitive controls enhance gameplay for the best experience possible! The graphics in Bubble Town are smooth and bright, with nice contrast for fun, effortless matching! Won't You Take Me To - Bubble Town? Have you ever been killing it in a bubble shooter game and thought to yourself 'If only I could earn some money with these puzzle-busting skills!'? If so, I've got good news for you: Bubble Town makes that gaming fantasy a thrilling reality. That's right! You can actually earn some cold, hard dough by making matches on a bubble grid. And here we've been slaving away, crushing candy for nothing all this time! But like all amazing things, there is a caveat: If you wanna walk away with the money, you've got to beat the other player. 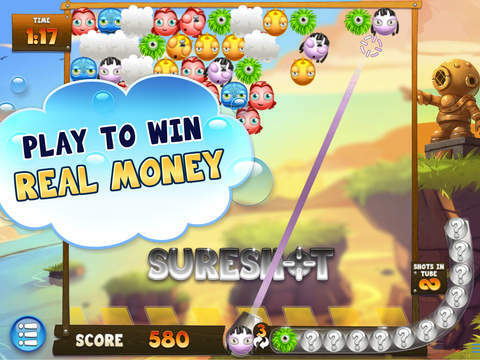 Yup, bubble matching just became a multiplayer event with moolah on the line. So, does Bubble Town deliver a satisfying bubble popper experience? Read on to find out! You've probably played a bubble popper game before, even if you didn't know it by name. 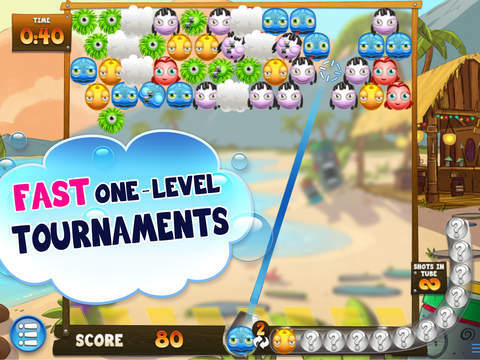 bubble shooter puzzles present players with a grid, and that grid contains objects of varying colors. In some games, you swap adjacent tiles to make matches of 3 or more. In Bubble Town, you fire additional bubbles up into the grid instead. Each shot either makes a match by connecting with bubbles of the same color or it sticks to objects of a different color, making the grid above more full and giving you more to clear. In Bubble Town, it's not good enough to just fire off easy straight shots in rapid succession. Instead, the game doles out points based on difficulty. If you want to reign supreme in competitive matches, you're going to need to master bankshots. The more difficult the shot, the more it's worth, so skillful gameplay is strongly rewarded. This seriously ups the challenge for everyone involved. When money is on the line, the controls had better be tight! Luckily, the controls in Bubble Town are top notch, really showcasing just how responsive a touchscreen can be. Firing shots is simple. Just press and hold the touchscreen to start aiming the cannon. Drag until properly lined up and aimed and then release; the shot will fire automatically! Need to cancel a shot? That's easy, too. Just drag your fingertip until it's on the base of the cannon. Then release and the shot is canceled. You can either play this game with practice tokens (which aren't worth any real money) or with real money. The practice option is great for practicing and getting a feel for how the game works. Even longtime players of these sort of games will require a bit of practice to get the hang of going head to head against an opponent in real time. Technically, you never have to make the switch from practice tokens to real money, though it's borderline guaranteed that you will. It's too fun to play with actual cash on the line. The menu is clearly marked and easy to navigate, and the store is unmistakable, making it practically impossible to enter on accident. You'll only be adding cash to Bubble Town if you intentionally choose to do so, which is nice. Town keeps track of wins and losses, and it assigns a rank based on your progress. This makes it possible to climb the ranks and level up in your League. Leagues are important because they determine what prizes you can play for. Plus, they're a fun status symbol. Work hard, rank up and rise to the top! The pieces in this game aren't just bubbles. They're living critters called Borbs. Each Borb color has a unique facial structure, and they 'watch' you as you play the game. If all those sets of staring eyes (or in Greeny's case, eye) start giving you performance anxiety, you can always turn faces off (available in the settings along with sound) and turn them into smooth, marble-like bubbles. The game grid will occasionally contain powerup pieces. Hit them or make them fall to activate their power. Sureshot gives you the accuracy of an eagle for the most precise shots, and hotfoot blows through a section of the board, clearing away Borbs of any color. Some puzzles will be peppered with obstacles too, and these puzzles must be circumvented in order to move forward. When time is ticking and you're going head to head with an opponent in real time, getting obstacles out of the way quickly is essential! Think fast! Bubble Town automatically assigns a username, and you're given the option to change it once if desired. In addition, you can set your own unique shout out and avatar, making it possible for each player to differentiate themselves from the rest. Playing in real time against real people is amazingly fun, and it gives the game a feeling of in-the-moment immediacy that wouldn't be possible otherwise. It's amazing to play a bubble popper with real money stakes. It ups the competition considerably, even when the amount of the bet can be measured in pennies and dimes. There is just something about actually putting money 'out there.' The idea that the other person will walk away with that money if I lose takes this already challenging game and turns it into pulse-pounding mayhem. Needless to say, I hate to lose! I seriously doubt anyone will rake in a big payday by playing Bubble Town (but never say never, right?). However, I think the real money aspect is included just to make things more competitive, and it works! When/if you choose to pick a username that's different than the one automatically generated by the game, you need to choose carefully because you can only change it once. Bubble Town is the type of game that could be played for years, long after the book, movie, meme or band referenced in a username is out of style. Since every player has their own numeric player ID, an unlimited number of username changes should be possible, because what difference does it really make? So, choose your username carefully! Bubble Town takes excellent bubble popper gameplay and adds a surprising new spin on it, making it thrilling and competitive in the extreme! Overall, this game scores a 9.0: Superb. It's challenging, and it has endless replay potential. With a pricetag of free (practice rounds cost nothing), there is no reason not to give this game a whirl. Maybe I'll see you there? With the worldwide, realtime gameplay, it could happen!